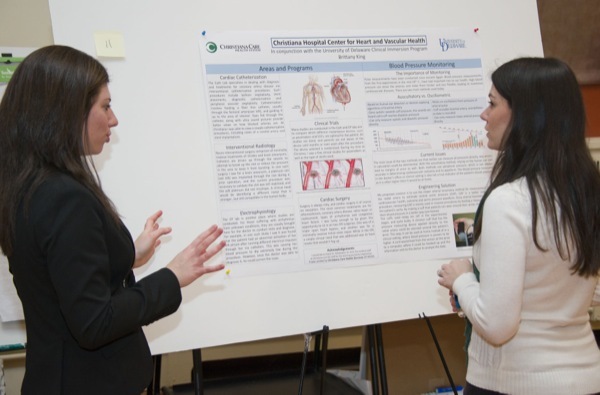 Undergraduate students proposed engineering solutions to unmet clinical needs in a poster session as part of the Biomedical Engineering Program’s Clinical Immersion Experience. 10:03 a.m., Feb. 28, 2014--For the Record provides information about recent professional activities of University of Delaware faculty, staff, students and alumni. Subramani Sockalingam, a doctoral student in mechanical engineering, won third place in the Baltimore/Washington SAMPE University Research Symposium held Feb. 26 at the University of Maryland, College Park. 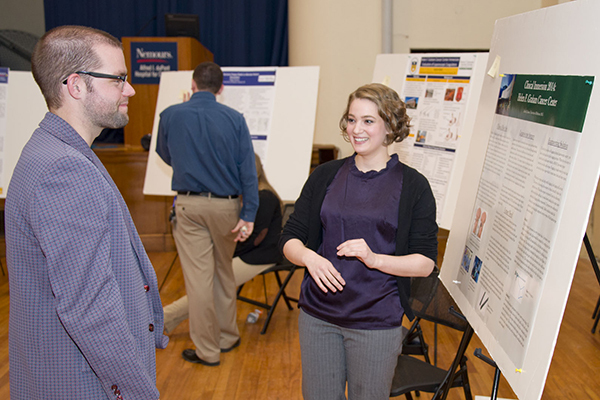 Students representing each region member university showcased their research through posters and PowerPoint presentations. Sockalingam is advised by John W. Gillespie Jr., Donald C. Phillips Professor of Civil and Environmental Engineering and director of the Center for Composite Materials, and Michael Keefe, associate professor of mechanical engineering. 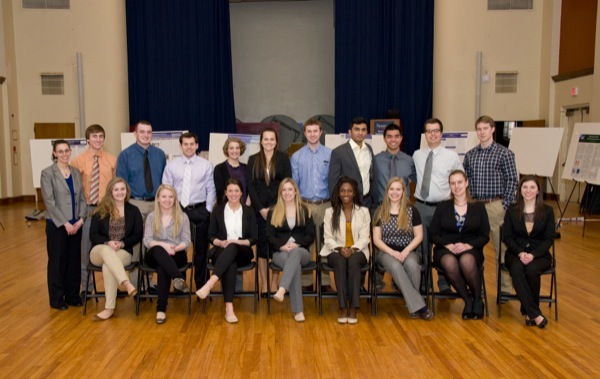 Eighteen undergraduate students proposed engineering solutions to unmet clinical needs in a poster session as part of the Biomedical Engineering Program’s Clinical Immersion Experience (BMEG 367) on Feb. 7. During Winter Session, the students spent over 125 hours in a clinical setting, gaining first-hand, often eye-opening experiences about the clinical applications of biomedical engineering, as well as opportunities to practice interdisciplinary communication and clarify their career goals. This year’s clinical partners included Christiana Care Health System’s Helen F. Graham Cancer Center and Center for Heart and Vascular Health, the Nemours/A.I. duPont Hospital for Children, Independence Prosthetics-Orthotics, UD’s Infant Behavior Lab in the Department of Physical Therapy and UD’s Early Learning Center. Martha Carothers, professor of art, presented "Special Collections: A Wealth of Resource Material," at Lahore College for Women University, Institute of Design and Visual Arts, and University of the Punjab, College of Art and Design, in Lahore, Pakistan, Jan. 21-22. Kelvin Ramsey of the Delaware Geological Survey gave a presentation titled "Geology of Parks from the Ground Down: How Understanding Geology can Aid in the Care and Interpretation of Your Park," at the annual Delaware Recreation and Parks Society meeting, in Wilmington, Del., Feb. 26. Margaret D. Stetz, Mae and Robert Carter Professor of Women's Studies and professor of humanities, has an essay in the current issue (Vol. 6, No. 2) of the Journal of Neo-Victorian Studies, an electronic journal published at Swansea University, Wales, U.K. Her article, "The 'My Story' Series: A Neo-Victorian Education in Feminism," explores the feminist politics of young adult historical fiction issued by the British publisher, Scholastic Books.